This CD contains 13 traditional Yule-tide tunes played on traditional American Folk Instruments including hammer dulcimer, mandolin, dobro, autoharp, guitar, harmonica and bass. 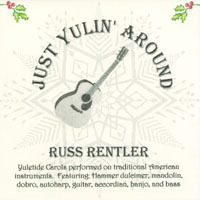 Russ Rentler has tastefully interpreted these classic Christmas tunes with a bluegrass/celtic,and Old-Timey feel. You will find yourself playing this CD long after the holiday season is over! Russ started playing stringed instruments with his first ukelele in 5th grade purchased with S+H Green stamps in Dover, NJ. After a brief stint in heavy metal bands in high school he discovered bluegrass which led to a life-long love of acoustic music. At his first night at Moravian College, he met John Gorka where they were both playing at an open mic. They soon formed a band with Doug Anderson and were joined the following year by Rich Shindell on lead guitar. Russ was the mandolin player , John played incredible 5 string banjo and Doug Andersen provided the solid rock rhythm on his custom made Froggy Bottom guitars. Throughout all four years of college, they played throughout the Lehigh Valley centering around Godfrey Daniel's and the southside of Bethlehem, PA.
After college, Russ went to medical school, Doug received a Ph.D. and needless to say, John and Rich went on to well-deserved fame and glory in the folk music world. During his medical training, Russ continued to pursue his passion of acoustic music and picked up hammer and mountain dulcimer, fiddle, dobro, autoharp and bouzouki. He also started building his own hammer dulcimers and uses his own instruments on stage. While continuing to practice general internal medicine, Russ played every chance he could at local bookstores, churches, open mics and music festivals. On several of John's return trips to the Lehigh Valley, Russ has joined him on stage . Instrumental renditions of traditional Christmas carols with a folkloric twist. Some have an antique-music-box quality, others a lively mountain spirit, still others evoke a feeling of sacred peace. Toes will tap. Bodies will sway. Faces will smile. That's what it's all about, Charlie Brown. Fun acoustic music that's sure to get you in the Christmas spirit. He plays all those instruments??? Cool.